LeoCAD currently has a library of more than 1000 different unique pieces (but they don't represent any particular brand), most of them created by James Jessiman (the author of LDraw). 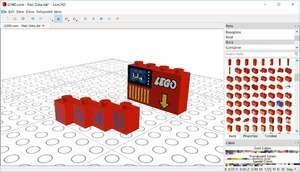 LeoCAD is a CAD program that allows people to build virtual models using bricks similar to those found in LEGO toys. LeoCAD can be used to create building instructions and animations, making it a very powerful editor. Each object in a LeoCAD project can have a different position and orientation for each step or frame that it appears. Version 18.02 is a freeware program which does not have restrictions and it's free so it doesn't cost anything. For security reasons, you should also check out the LeoCAD download at LO4D.com which includes virus and malware tests. Additional screenshots of this application download may be available, too. LeoCAD download been highly rated by our users.